The one of its kind of snack that has drawn my attention is tartlets. All thanks to my sister's frequent visits to Denmark am getting many new ideas for evening snacks. She bought me few packets of readymade mini tarts. She roughly explained me what kind of stuffing I can come up with. They not only are in varied taste and looks ( as per different flavors), but they gel with any kind of occasion. Be it during evening treat or a picnic at a nature spot, you can take them out of the basket, spread the happiness with a thermos of tea or coffee. As I mentioned before the flavor, stuffing can have various options that you may like to add. Make it vegetarian by skipping chicken ! Salt and some coriander leaves. Wash and chop spinach leaves dab a kitchen towel to absorb remaining water from the leaves. 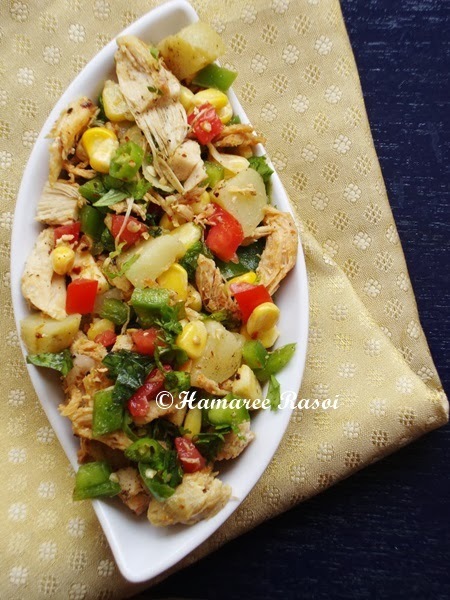 In a mixing bowl put corn, potato chunks, chopped capsicums, chopped chillies, shredded chicken, chopped coriander leaves, de seeded chopped tomato, grated cheese and mix with a fork thoroughly. Season with salt, oregano, chilli flakes and chilli oil. Pre heat oven to 170 Degree Celsius. 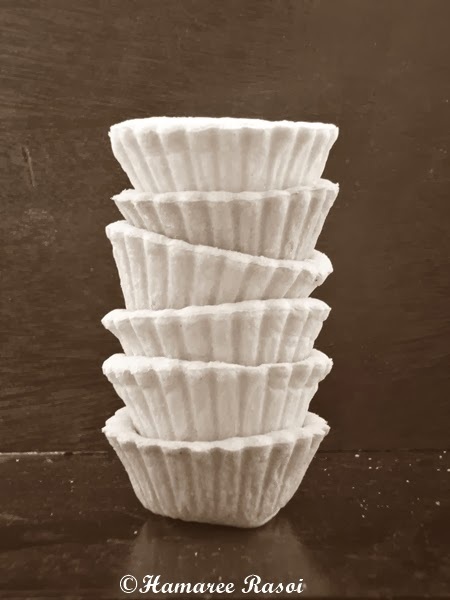 Take a cupcake pan and place the readymade small tart inside the case. Spoon 3 tbsp filling inside each tartlets Bake for 8-9 mins. Stand for 5 minutes and serve. Looking delicious....love the last click! 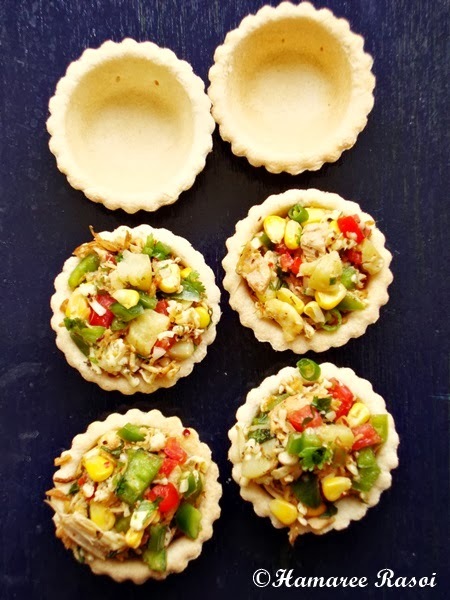 Delicious looking tartlets,loved the stuffing..
yumm... that looks really delicious... addition of cheese takes it to another level altogether! Very nice party dish it seems. 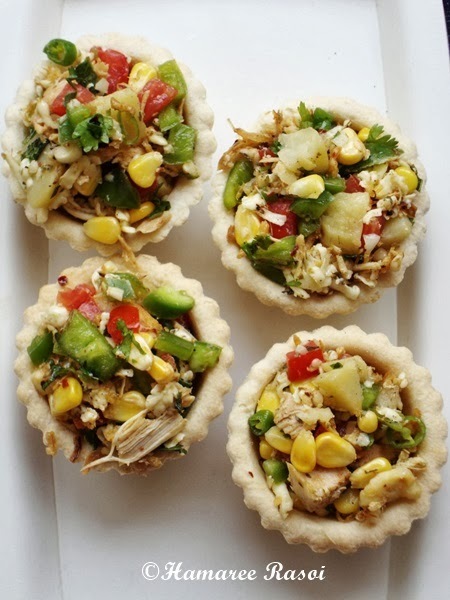 Love this tartlets ! 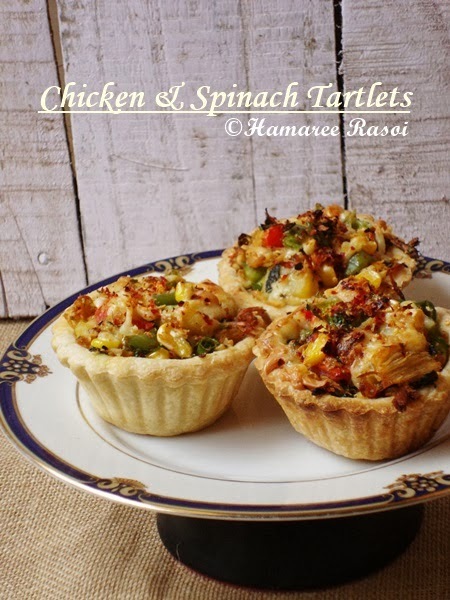 Yummy and delicious savoury tarts! Happy New Year and a Wonderful 2014! I forgot to mention I love the new fresh blog look.Sorry Its been awhile since I dropped by. That looks like a great filling. Lovely snack idea! 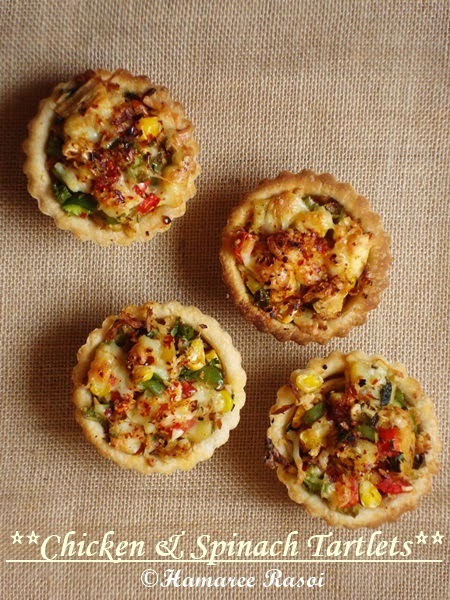 These savory tarts look awesome, yummy filling!